The night before our wedding, Nick and I were still awake practicing our first dance one last time. We’d agreed that we didn’t want to see each other on our wedding day until the ceremony, so as midnight approached, Nick left to spend the night at his mom’s house. I stayed up far longer than I should have, but if I’d gone to bed I wouldn’t have been able to sleep anyway. I woke up feeling completely alert yet completely tired as well. Luckily for me, the “tired” part of that faded away quickly and wouldn’t return until after the night was done. Also lucky for me, since our ceremony wasn’t starting until 5PM, I didn’t have to wake up as crazy-early as many brides do and managed to sleep until 9:00. After a small breakfast, I headed over to the salon at the corner to have my makeup done. And let me tell you, it was perfect! I was worried because it would be my first time ever wearing fake lashes, and the second time having airbrush after a horrible first-time experience. I’d known from the start that I wanted to have my foundation airbrushed because my face is very splotchy and sweats easily around my hairline, but made sure to tell my makeup artist about this horrible first-time experience so that we could avoid that problem. She was wonderful, and took extra care to make sure I loved the way I looked. It wasn’t until the middle of my appointment that she even found out I was the bride, which was immediately followed by complimenting me for being so calm and collected. She was especially happy she’d nailed the airbrush after that. Having my makeup done at Bellisarios was the perfect start to my day – I left feeling relaxed, ready, and beautiful. Which was much better than having my nails done a few days prior. Ooooooh boy I was NOT a happy camper during that. My mom, sister, and I went to the place we always go, yet I was sat down with the lady who was having major life issues at that time. Apparently, her and her husband (our favorite nail artist there, but more importantly they work together) were getting a divorce and it was going badly. My sister was sat down with him, and then I was with her. I showed her a picture of what I wanted and it did not turn out anything like the picture (see right). I even asked her to put a few more sparkles on to get the gradient look a little better, and she put, like, 5 more sparkles on. I was tearing up while sitting at the dryers afterward, and my wonderful sis noticed. I didn’t want to be “that” bride, so when she asked me if we should have them fix it I just sat there like a sad puppy and said no. She then made me take her seat and asked our favorite guy, Kevin, if he could please fix this. He took one look at the photo and was like, “Oh yeah! I’ll fix that no problem.” And he did. In like a minute. 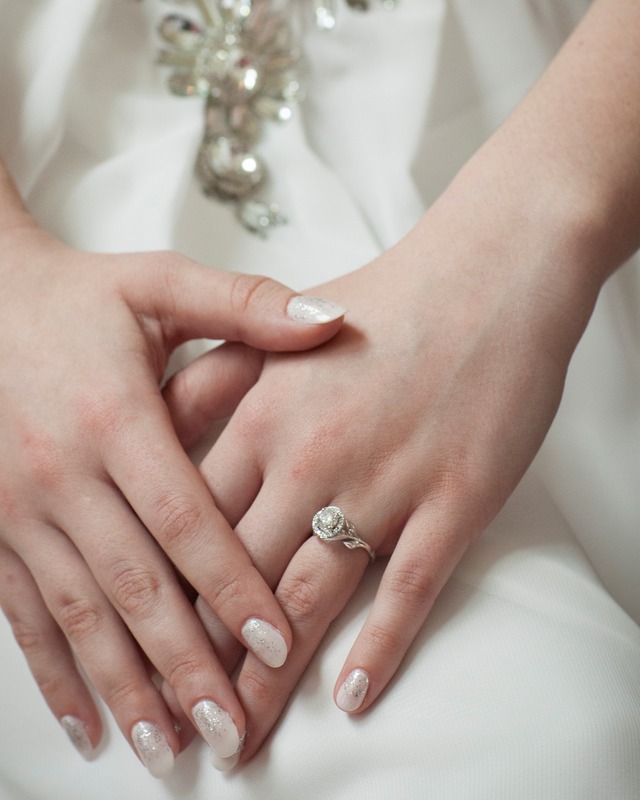 He was the miracle-worker for my nails, and I’m so happy that my sister did something about it. Ok, back to the good stuff. I headed back to my parent’s where my bridesmaid Kayla was waiting for me. Kayla is a hair stylist, and she’d brought her friend Marissa to help do mine and other bridesmaid’s hair for the day. Both Kayla and Marissa are perfectionists when it comes to hair, taking their time and working each strand to make sure it’s doing exactly what it should. 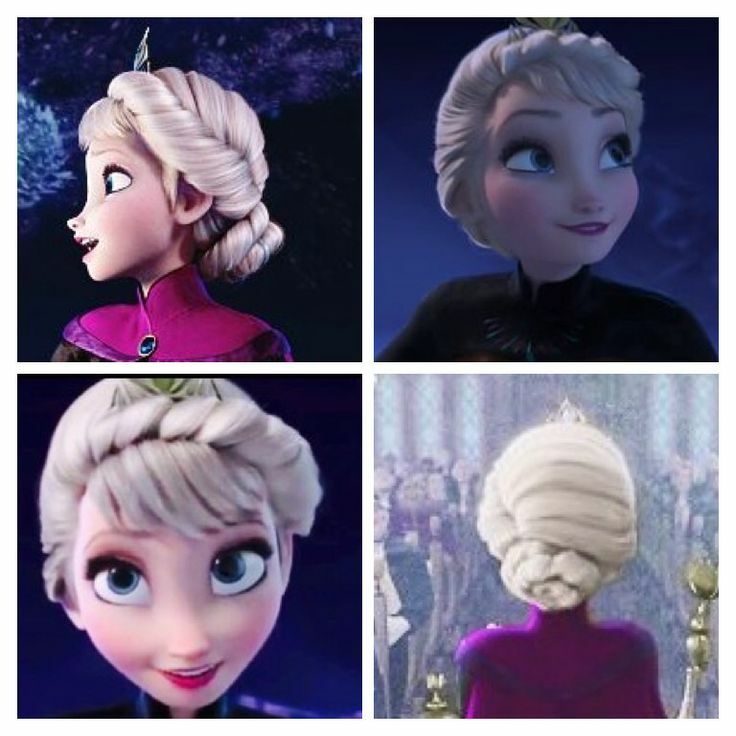 For me, I’m currently obsessed with the twist-across-the-hairline look, and asked them to make my hair look like Elsa’s (yes, the Frozen one) from her coronation.Kayla and I had already had a practice run during my wedding shower, so we knew she was comfortable with it and it’d look amazing. And of course, it did. Then I had to make the call. Well actually, then I received the call about making the call. All week, we’d been keeping an obsessive eye on the weather. It hadn’t been looking too good at all. Every report was predicting rain, and as the week went on it grew to thunderstorms all day long. Nick and I discussed it every day. We’d decided that, when the call came, if the percent-chance was 50% or less, we were going to risk it and have everything align with our vision – outdoors. And we are incredibly happy to have made that decision! The only rain we saw that day was for a whole 10 minutes in the morning. You’d never guess from our photos that it was supposed be thunderbolts and lightning (very very frightening). And then our limo arrived! My mom had arranged a limo to drive us from the house to the venue since all of my bridesmaids had dates that would be driving them home. It was extremely kind of the company to let us rent the limo for such a short period of time, and we really appreciated it. Between home and the venue, we were making a quick stop at the Illuminated Mural in Detroit for some shots of me and my girls. It was during this drive that the 10 minutes of rain I mentioned earlier happened. I was worrying that we wouldn’t be able to stop at the mural with this weather, and getting worried about my decision earlier to keep our reception outside, but the moment the rain stopped the sun came out shining and all was well. When we pulled up to the mural, we were surprised to see another bride there. Turns out they were actually getting married in front of the mural in a few minutes! Luckily for us, they were kind enough to let us grab a few photos before leaving. So I didn’t get all the shots I wanted, but at this point I was really just happy to have had any at all. Nick and I had agreed that we’d write each other little notes to read before I walked down the aisle. About half an hour beforehand, Nick’s letter showed up in my hands and everyone got quiet while I read it. He is the cutest. His letter was perfect. When I was done, of course all my girls wanted me to read it out loud. Problem was, I knew that if I’d read it out loud, I’d start crying and didn’t want to ruin my makeup. So my mom snatched it up and began. By the time she got to the end, all the criers of the group were identified. Kayla even shouted “Damn it, Nick!” as she worked to keep her makeup in place. After everyone pulled themselves together, my little cousin (who was our ring bearer) got all shy as he came to sit next to me. Turns out he had a gift for me! He is just so stinking cute. I opened it and there was a peacock necklace he’d picked out. It was definitely me, this kid knows me so well. I squeezed him nice and tight to make sure he knew how much I appreciated it. And then it was time to line up! Right?! And I love the .gif you have from you and your hubby in front of the Illuminated Mural – so adorable!